Friday was the last day of school! All of our kids, except Sydney's oldest who is in kindergarten, is done with pre-school for the summer. 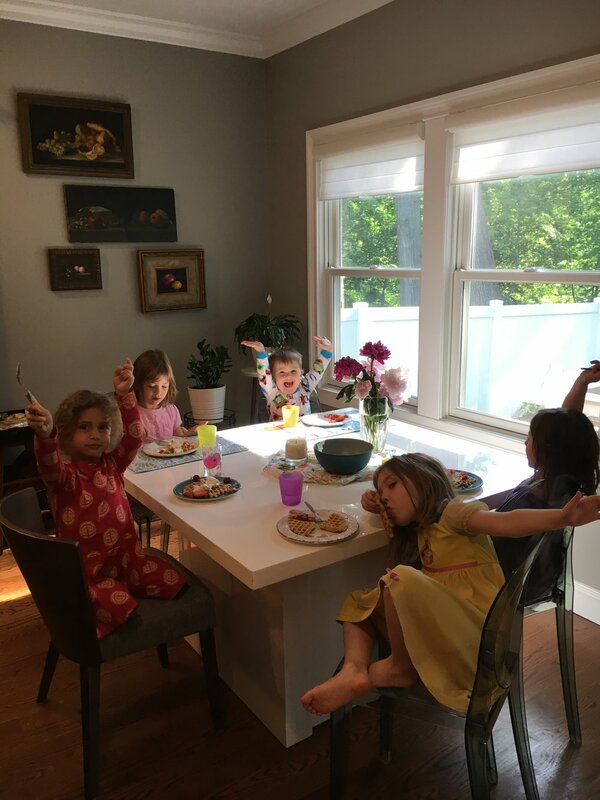 My oldest, Elise, is going to kindergarten in the fall, so I asked her what she wanted the most for breakfast, since we didn't have to be out the door at 8:30 a.m. She asked for waffles with whipped cream and strawberries. That child looks like her father and his mother, but she has my palate. Of course, Elise asked for waffles the night before, which is the customary time to build your sponge when using sourdough. But I ALWAYS forget until the day I'm planning on using it. So I decided to make this recipe with a same-day sponge for all the well-meaning people who don't always plan 12-24 hours in advance. 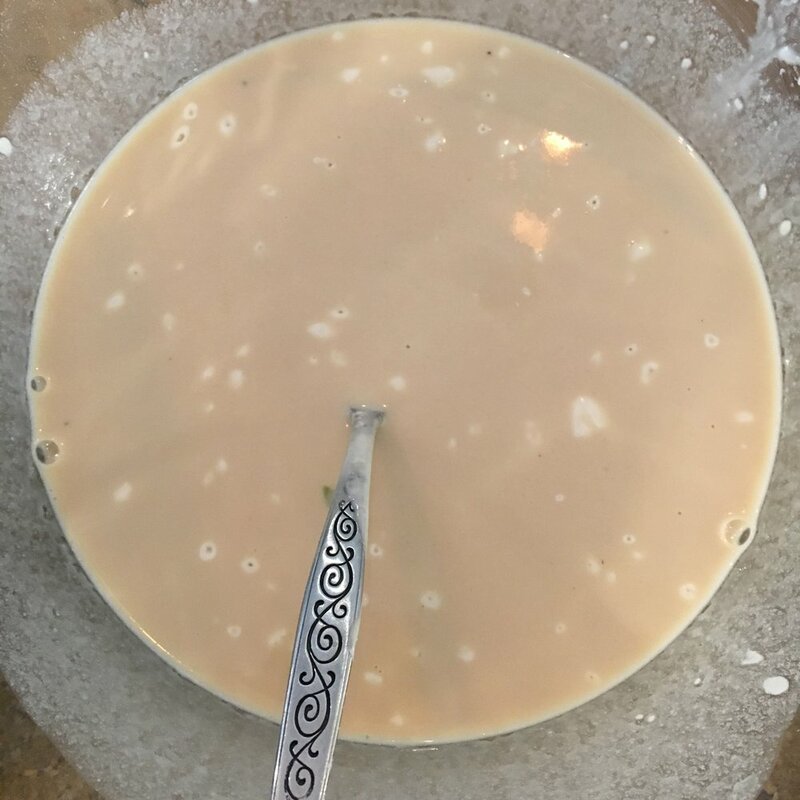 Last August, I started a sourdough starter, which I had since let grow over with pink mold. Sydney's, however, is as healthy as can be. So she brought her jar over at 7 a.m. I started by taking one cup of Sydney's starter and combining with with 1 cup of whey, from a homemade ricotta recipe we made in workshop. If you don't have whey, you can use buttermilk or even milk. 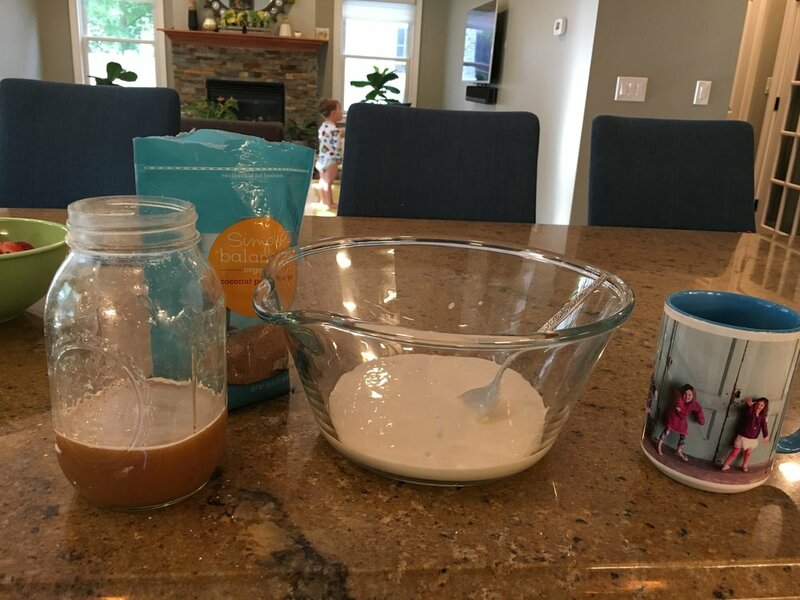 I warmed the whey, which was refrigerated, in for 1 minute in the microwave and then dissolved 2 T. of sugar, and stirred this into the starter. My thinking was that the nice warm whey and slightly more sugar than normal would make the starter very hungry and get bubbly fast. Then I added the flour, and let all of this sit for over an hour. It got nice and bubbly, just as I hoped. Then I added egg, butter, vanilla, salt and baking soda and let it all sit for another 15 minutes, while the waffle iron got nice and hot. I sliced up some strawberries and whipped heavy cream with a splash of vanilla and a small bit of sugar. 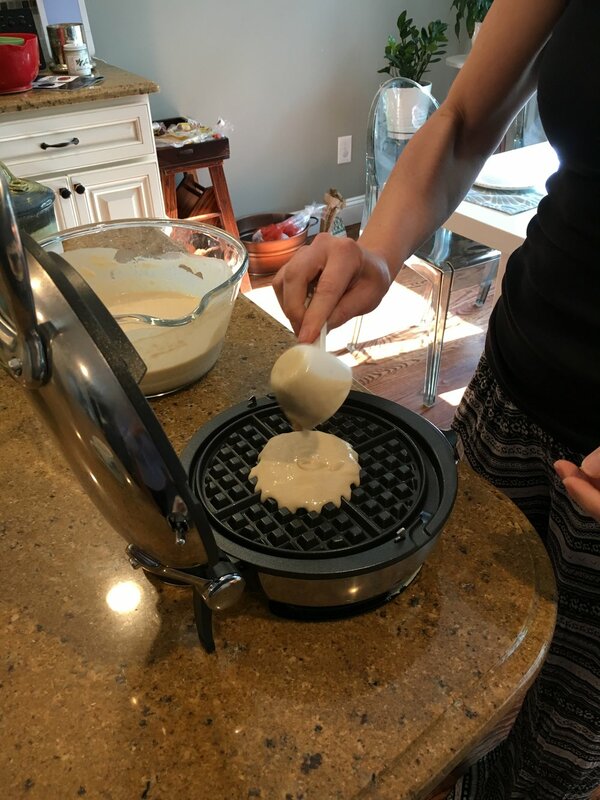 The result was a very light, airy waffle, which benefits from a few extra minutes in the waffle iron for a crisp crust. Delicious. Warm whey for 1 min. in the microwave and stir in sugar. Stir into sourdough starter. It's okay if there are pea-sized lumps. Add 1 cup of all-purpose flour, combine and let sit for an hour or more. To batter, add the egg and mix well. Then, add melted butter, vanilla, salt and baking soda and mix. 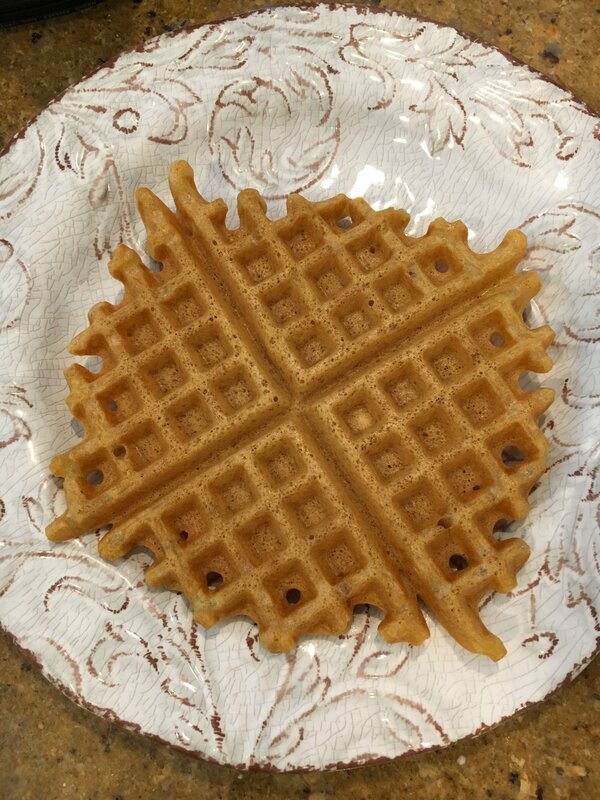 Pour 1/3 cup of batter into hot waffle iron and cook for 3-5 minutes, depending on your iron and your preference. I like them dark and crisp. You can also thicken this batter with 1/4 cup of flour and fry as pancakes, if you don't have a waffle iron. Top with whatever you like and serve. Combine all ingredients in a bowl and beat with an electric mixer until stiff. You know it's stiff when you take the beater out and a soft peak follows the beater and stays put.